Posted: Tue May 26, 2015 4:20 pm Post subject: Newbie needs advice on severe hive issues. I have two TBH's (H1 and H2) with bees from nuc's that have been in place for almost a month now. The weather has been partly cloudy to cloudy since I've had the bees with approx. 7 inches of rain this month alone with temps ranging from low's in the upper 40's to highs in the low 80's. Things seemed to be going well until a couple of days ago when I noticed that there wasn't much activity around hive H2(maybe 10 bees a minute). H1 has appeared to be the stronger of the two from the beginning but activity around H2 has been very slow for the last couple of days. I also noticed what at first appeared to be some sawdust under H2(screened bottom) and was told it was probably chewed wax. I decided to investigate to see if I could determine what was going on inside the hive. There were lots of bees on the existing nuc comb and on a bar of new comb, however when I brushed the bees off there was little brood and most of it was drone brood. I also noticed some wax chewing on old comb and more on new comb. The new comb had very deep cells and it looked like large portions of a few cells had been chewed. I did see one hive beetle and 3 larva on the screen. Also some nectar and pollen in combs. (I am using a following board with a total of 7 bars (consisting of 5 of the chop & drop from the nuc and 2 new bars). I finished my inspection at this time. Several hours later I noticed that both hives were now very active (20 or so bees constantly at the entrances) and was very pleased....however my jubilation was short lived when I saw a swarm of bees on the ground approx. 5 feet from H2. It was starting to get dark and rain was imminent so I used one of the nuc boxed the bees originally came in and scooped up as many as I could then placed them into empty half of H1. I then got as many of the remaining grounded bees as I could get and put them in with the others. I did not ever see a queen, but I'm a newbie and could have missed her. It is very possible that the queen fell from the hive when I was CAREFULLY brushing the bees off so I could see the combs. That was yesterday. This morning I did not see any bees on the ground (alive or dead) and the bees I placed in the other half of H1 were clustered in one spot. Each hive has an entrance on each end. I keep one blocked however and until now have been using the following board to keep bees in only one half of each hive. The swarmed bees have an entrance of their own. I have not looked in either hive to try to determine if the swarmed bees were from either H1 or H2, (raining again today) but I feel that is likely the case. Question:Should I leave the swarmed bees in the half of h2? Do I need to feed them? I don't think I have enough extra comb in either H1 or H2 to give them any. I'm thinking of piecing together old comb from the chop and drop to give them. If they swarmed from either H1 or H2 do I need to re-queen or wait a while to see what happens? When you did the chop and crop, did you safely transfer the queen to the new hive? I'm wondering if the queen in H2 got damaged or lost in the process. Or has perhaps just failed..... were there plenty of eggs and young larvae when you did the chop and crop? They should have been able to raise an emergency queen if there was but perhaps the bad weather has prevented a mating flight. A photo of things would be so much more helpful, but I think you need a set no of posts before you can link to a photo album.. The debris and chewed comb may indicate robbing. If the colony is failing, the other one will most likely rob them out. The cluster of bees on the ground is too much of a coincidence to appear after you have done the inspection to be anything other than a dropped queen. For future reference, if you put a box (I use a cardboard box and put a sheet of plastic over it if it is going to rain) over them they will climb up into it and cluster at the top and it is a simple matter to pick the box up after an hour or so and most of the bees will hang inside it. You can then tip/shake the bees back into the hive. I would say that those bees probably need to go back into H2. When you are inspecting, shake the bees off or gently blow on them.... some bees will take exception to this but mine mostly move away from your breath (make sure no garlic or alcohol or banana breath though) rather than brushing bees and always, always hold the combs over the hive. Going to have to come back to this as something has cropped up. More info re the brood you saw in H2 would be helpful.... what stage was it at... ie did you see eggs and larvae or just capped.... was it all drone brood. Did it look like normal drone brood or was it in small cells. Will be back later to write more. 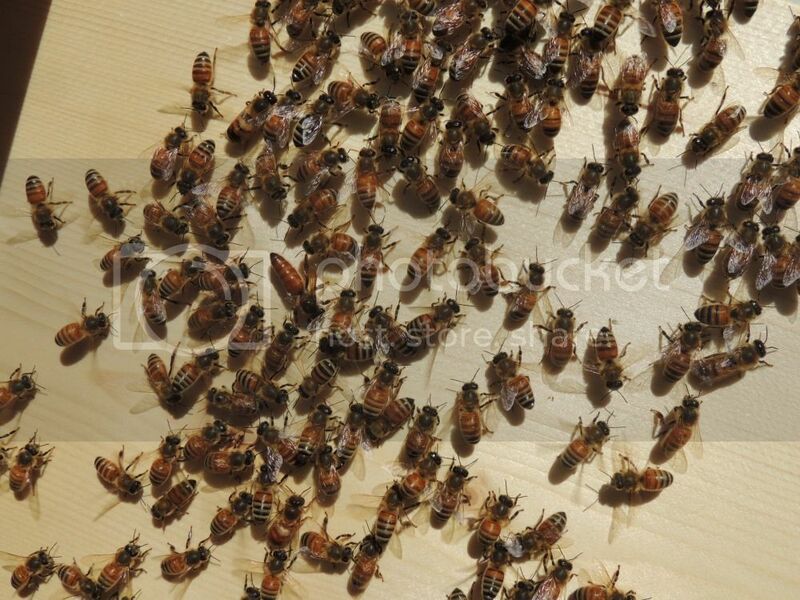 Sorry about that, I had a swarm of my own to sort out. By the sound of your weather, these bees all need feeding especially if you have not been doing so before. To only have drawn 2 combs a month after the chop and crop, is pretty slow progress and suggests they are struggling. Have you inspected H1 since the chop and crop and if so, what is it looking like? How many combs have they built? As you say, this cluster of bees on the ground has to have come from one of your hives and if you believe you may have dropped the queen during the inspection, then this is the most likely reason for it. If it is a genuine swarm, then there will be queen cells in one of the hives. Familiarise yourself with what they look like and then check H1 in the next few days looking for them, particularly at the edge of the comb. If you notice eggs and young brood, then this colony has not swarmed. As regards H2, a failing queen will not swarm. If it is definitely not from H1 then I would reunite them in H2 and give them a comb of young brood/eggs from H1 so that they can make an emergency queen. These bees are going to need a lot of help if they are to make it. The worry is that they may have developed one or more laying workers. Another question... how far apart are the two hives? You say the cluster was 5 feet from H2.... was it much closer to H2 than H1? Sorry, the above is not terribly coherent. It's just really difficult to understand your set up and figure out all the possible options of what has happened and what you need to do to identify that and deal with it. ....In the next few days when the weather allows, check H1 for young brood and queen cells. If you see young brood (eggs/larvae) look no further. If brood is mostly capped and there are queen cells, then this colony may well have swarmed. If the queen was clipped, she would end up either on the ground near the hive with the swarm or climb up the hive and cluster on it. This will tell you whether or not the cluster came from H1. If it didn't, then it's reasonably safe to assume it came from H2 and you need to reunite asap, establish if there is a viable queen and if not, requeen or combine H1 and H2. Hope that is a little clearer. Shout up if you need advice on reuniting. If you can take photos during an inspection, it's really useful, as you can pore over them later and see lots more than you do in the "heat of the moment". If you can post them here then even better. Posted: Wed May 27, 2015 2:51 pm Post subject: Newbie needs advice on severe hive issues. Hi Barbara, Thanks for responding so quickly. OK, where to start.....Well, to make a long story short, the swarmed bees have swarmed again and are now gone! They had indeed come from H2 as it was empty. Backing up a little, I had put the bees that were on the ground in half of H1. The weather cleared enough for me to check on them and when I did they were all clustered in one spot so I decided to look for a queen since I suspected that I had a laying worker in that colony. However when I moved them around, I found a queen! No doubt about it. I then added several empty combs to the hive and put sugar solution in with them. Not more than 30 minutes later I check on them and found them on the ground again in the exact same spot and the half of H1 I had put them in was empty. I was going to gather them up again but by the time I had my suit on they had moved into a nearby tree too high for me to get to. At this point I let them go. There are still some bees on the ground however. Can I gather them and add them to the other hive? When I initially checked on H2 the brood pattern was very sparse with little or no worker brood. There was some pollen and nectar but not a lot. When the bees swarmed for the second time, I took these combs (3)and froze then to kill the drone brood, then put them in the remaining hive. Was that OK? When I did the chop and drop I had help from a more experienced TBH'er. Each nuc had 5 frames with several in each nuc being heavy with honey and some pollen stores. I honestly don't recall the brood situation since this was my first time and I was very excited and nervous about the chop and drop. I'll take photos next time! I placed the chopped comb in the hives so the bees could clean it. I do remember that there was at least one empty frame in each nuc though. Nothing at all on it. I guess in hind sight this should have sent up a red flag, but I figured by adding the chopped comb to the hives in addition to the honey combs I would be OK. And of course there's my lack of experience to consider. I have watched for pollen laden bees and remember telling my C&D buddy that I wasn't seeing bees with pollen going into H2. I assumed it was because they entered the hive so quickly that I just missed them as I do not have landing boards. I have however seen many pollen laden bees in my yard. White clover has been blooming (and still is) in near-by fields in addition to wild berries. I take walks in the field and see many honey bees on the clover. I am assuming they are my bees but who really knows? I have planted many bee friendly plants and flowers, but most have not started to bloom at this time. Should I feed the remaining hive just to be on the safe side? I am getting a little concerned that I am interfering with my remaining bees to much and they will leave also. Yes, I've developed rejection syndrome! I did take a few pics of my initial H2 inspection and will post if I can figure out how. Thanks again for helping me figure out what is happening. 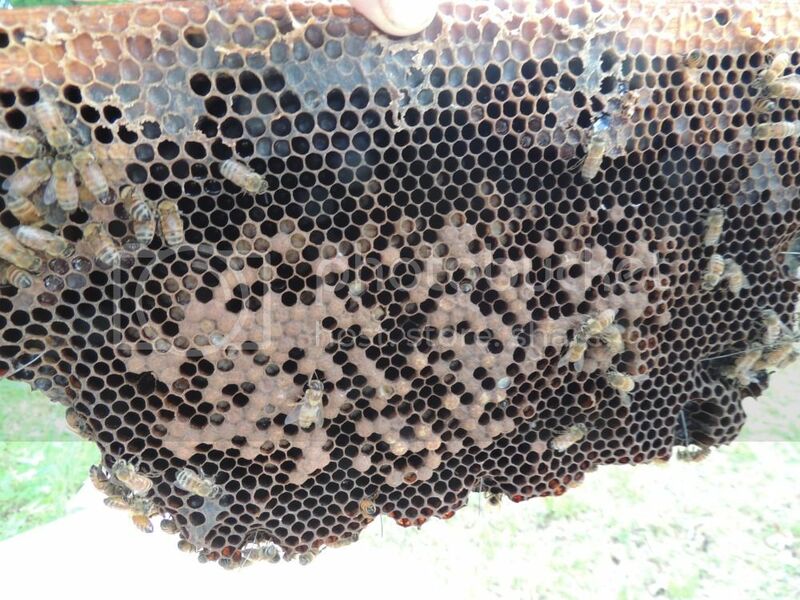 Posted: Wed May 27, 2015 3:12 pm Post subject: Newbie needs advice on severe hive issues. Hi again Barbara. Just a little follow-up. I placed a box on top of the remaining bees on the ground so I can add them to the remaining colony if you that that is OK to do. I also counted approx. 15 bees over a minute's time entering the remaining hive carrying pollen. Is this sufficient? Posted: Wed May 27, 2015 3:47 pm Post subject: Newbie needs advice on severe hive issues. well it seems I have to have 5 posts before I can post pics. Maybe this will count as one. Posted: Wed May 27, 2015 3:50 pm Post subject: Newbie needs advice on severe hive issues. Just spent ages typing out an extensive reply and I've lost it! Argh! 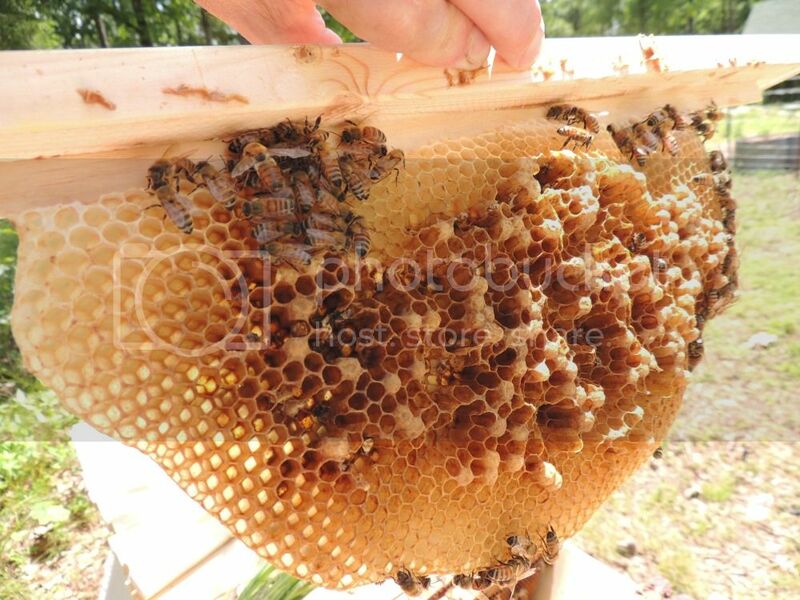 That comb and brood doesn't look healthy and I would either get a bee inspector to look at it if you have them ..... I really don't like the brown colour of some of that brood .....or burn it. Definitely remove it from the other hive pronto. I would even be loath to put the remaining bees from the ground in the hive, but since the hive has already been exposed, I might dust them with icing sugar and tip them in. If you leave them they may beg a home there anyway. It's difficult for me to assess if the other hive needs feeding, but since this one appears to have swarmed due to starvation and possibly disease, I would err on the side of caution and feed the other.... actually, I would inspect them and assess their stores and brood situation and feed if necessary, but that is easy for me to say with some beekeeping experience behind me. Sadly, you are on the steep and painful part of a big learning curve. I think the nucs you were sold may not have been as strong and healthy as they should have been, but a month down the line it is difficult to say for sure. It would be interesting to find out what the beekeeper who helped you install them thought? Good luck with the remaining hive. 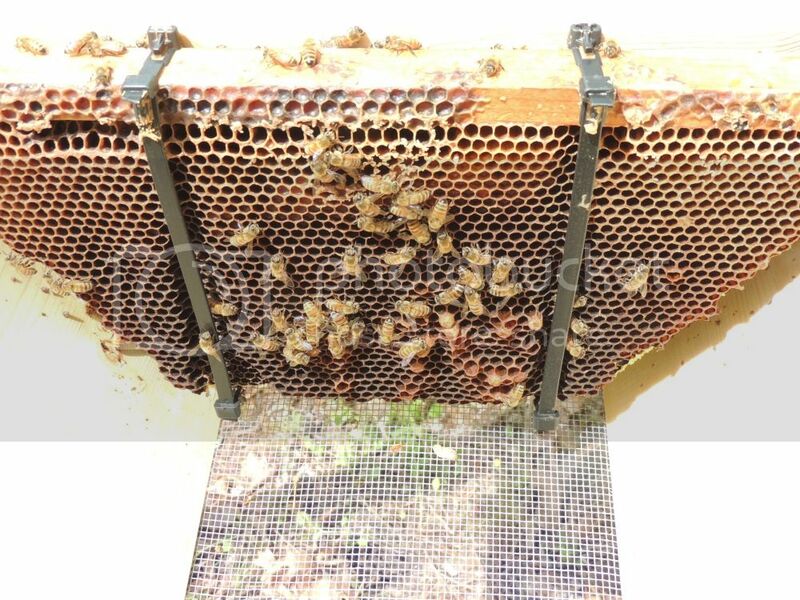 The "bumpy" brood pattern you see with the comb in picture two there I have seen before in a hive that had a drone laying queen. Drone larvae in work sized cells. A Drone laying queen can be as a result of an old or poorly mated queen running out of fertilised eggs or a new queen failing to mate. It is unlikely to be a laying worker as there is normal (albeit discoloured) worker brood present which would suppress that. I am sorry but I don't know what you can do for them at this stage when their numbers are so low. Posted: Thu May 28, 2015 3:15 pm Post subject: Newbie needs advice on severe hive issues. Barbara, well that's certainly not what I was hoping to hear but I appreciate your advice. I have sent an email to our State Bee Inspector with a photo of the discolored brood and am awaiting a response. However I do have more info as to the sporadic laying pattern and drone brood. The saga continues...... After seeing the swarm in the tree and later seeing it gone, I assumed the bees that were left on the ground were just that...left. I put a box over them hoping to get them to crawl to the inside top where I could put them in with the other hive. After several hours I noticed a cluster of bees on the outside of the box which looked suspicious so I gently moved them around and lo and behold, I found a queen! She only had one wing however and therefore couldn't fly. This could explain why the swarm in the tree was gone...since the queen couldn't fly, they apparently came back to the ground to be with her. She was thin (see pic, she is left of center) and I suspect a virgin queen who couldn't fly and therefore couldn't mate. That could help to explain the loss of brood and decline of the colony.....maybe? Even if this experience ends in me having to burn one (or both) colonies it has definitely been a learning one. After speaking to several Arkansas apiaries, I killed the deformed queen and put an open brood comb in with the now queenless bees. I did look for (and found) the queen in the strong hive. She was almost twice as fat as the deformed queen and lighter in color. Posted: Thu May 28, 2015 3:19 pm Post subject: Newbie needs advice on severe hive issues. AugustC....Thanks. That makes a lot of sense, especially in light of recent developments. See above post.